Alcatel and Metro by T-Mobile are teaming up to launch a new Android phone. 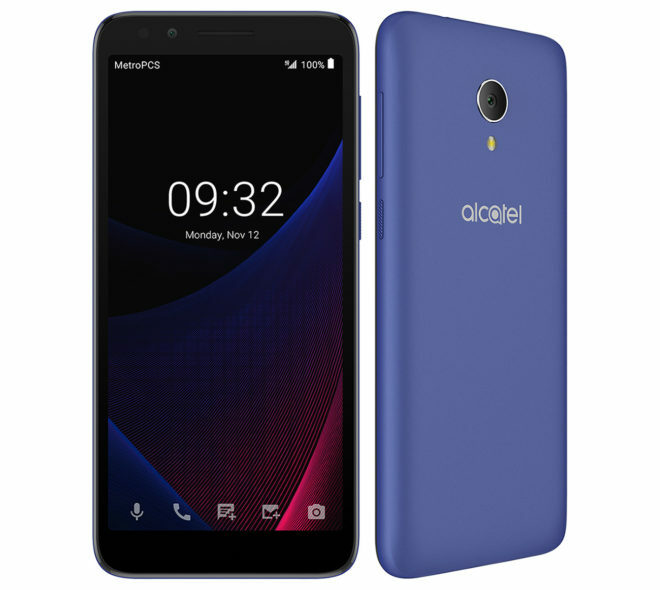 The Alcatel 1X Evolve is launching at Metro by T-Mobile on December 10. It features a 5.34-inch 960×480 display with 18:9 aspect ratio and a 1.1GHz quad-core MediaTek MT6739WM processor. There’s a 5MP camera above the screen for all your selfie needs and an 8MP camera with LED flash around back. Also packed into the Alcatel 1X Evolve is 16GB of built-in storage, 9GB of which is available to the user. If that’s not enough storage for your needs, you can add a microSD card to get even more. There’s 2GB of RAM included, too, as well as a 2460mAh battery, FM radio, a microUSB port, and Android 8.1 Oreo. One other notable feature of the Alcatel 1X Evolve is its support for 600MHz LTE, which reaches farther, is better at penetrating buildings than mid-band LTE, and has now been deployed by T-Mobile in more than 1,500 U.S. cities and towns. We don’t yet know how much the Alcatel 1X Evolve will cost, but given its spec list, this device could be an affordable way for Metro by T-Mobile customers to get onto that 600MHz LTE coverage. 1X. Even the model name is mediocre like the specs. I wouldn’t take this for $1.Seriously. Why do they even bother making garbage like this? Great way to downgrade the carrier brand. Not the fact that it’s an inexpensive phone,options are needed along all price ranges,but,the floor should be above this phone & its specs. Right or wrong,people who buy this phone will likely associate the performance of the phone (lack thereof) with the network itself. ‘Tis the season,it’s all about the timing,they’ll sell a decent amount of these for a month or two. Now, some are bound to disagree, that phones like this are good for non techies. But even then, there are plenty of big brand discount models, so a lesser brand has to offer more to compete. And I give people more credit than that . . they’re gonna compare side by side the floor models at different websites. Unless it’s a purchase for a tyke or great grandparent’s initial phone. Not only does Metro need a higher basic floor, but on the other hand it also has zero mid or flagship phones without mediocre specs. There is not a single model at over 6 inches, 128+gb, HD+, with NFC, SD slot and all Tmo bands. Not even close and not even something with near/most those specs, that could at least do as a holdover or emergency replacement. I’m not being elitist. A 64gb phone is not sufficient to hold everything I work on, notwithstanding SD plus sync and other tricks available. I am disappointed that the Metro version of the LG Stylo 4 only had 2GB of RAM. The unlocked one and the AT&T one had 3GB of RAM. There was also a non-US varient with 4GB of RAM. Would it have really cost Metro that much, to request from LG, a varient with at least 3GB of RAM? Just like everyone else did. Also, Metro should have signed on to sell the OnePlus 6T. Also, the Moto G6 series and the Z3 series would be nice. Former employee here…. Employees make more commission or bigger bonuses if they sell the cheaper/very budget phones. So employees are willing to sell this over iPhone because it gives them a fatter paycheck, which will in turn bring those customers back that bought the cheap phone cause it doesn’t work anymore in 6 to 9 months, creating this massive circle.